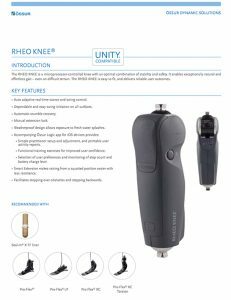 The RHEO KNEE is a microprocessor-controlled knee with an optimal combination of stability and safety. It enables exceptionally natural and effortless gait – even on difficult terrain. 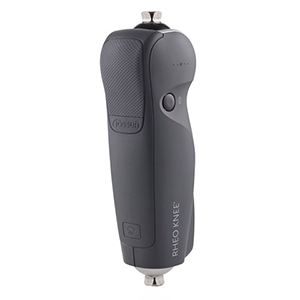 The RHEO KNEE is easy to fit and delivers reliable user outcomes. Auto-adaptive real-time stance and swing control. Dependable and easy swing initiation on all surfaces. Weatherproof design allows exposure to freshwater splashes. Simple practitioner setup and adjustment, and printable user activity reports. Functional training exercises for improved user confidence. Selection of user preferences and monitoring of step count and battery charge level. Smart Extension makes raising from a squatted position easier with less resistance. Facilitates stepping over obstacles and stepping backward.